You'll be surprised at the winner of this match-up. The semiconductor industry has been hit hard by fears of a slowdown this year. The benchmark PHLX Semiconductor Sector index has been volatile in 2018 as concerns about slow demand growth and a potential oversupply have hurt investor sentiment. Not surprisingly, shares of high-flyer Micron Technology (NASDAQ:MU) and radio-frequency (RF) chipmaker Skyworks Solutions (NASDAQ:SWKS) have crashed dramatically after a solid start to the year. Industry watchers believe that the situation could get even worse in the coming months, as the chip industry is likely heading toward a cyclical slowdown. In such a scenario, it wouldn't be surprising to see investors pulling their money out of chip stocks. But one of the two chipmakers in discussion could be a worthy investment despite the slowdown, and you might be surprised to find out which one. Time for Micron investors to hit the eject button? There's no denying that Micron investors have made a lot of money thanks to the massive rise in memory prices over the past couple of years. But they now need to accept the reality that the company is now losing that catalyst. Prices of NAND memory (commonly used in solid-state drives) are already crashing, and it won't be long before the price of dynamic random access memory (DRAM) goes the same way. 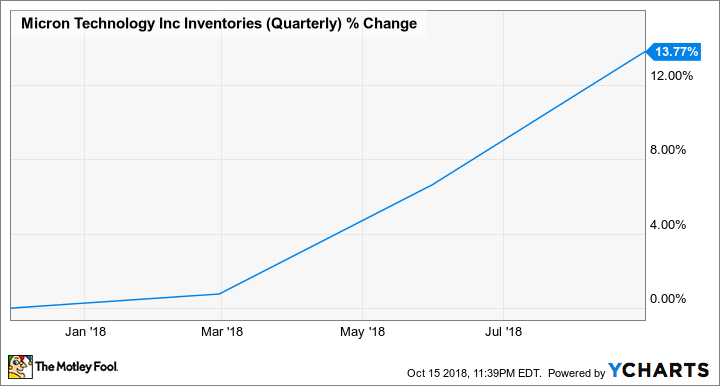 The fact is that Micron plies its trade in a cyclical industry, and it would be one of the first chip stocks to take a hit at any sign of weakness. That's because the company has a history of losing its wheels in times of low memory prices, which usually arise out of an industry oversupply. So Micron has taken off big time in the past couple of years on the back of favorable memory prices. However, the stock crashed 60% in 2015 when the memory market went through a cyclical downturn. Similarly, Micron investors weren't laughing when the price of 2GB DDR3 DRAM plunged to just $1 in early 2012 before a turnaround began. For comparison, the same product now costs around $1.6. The best way for Micron investors to make money is to get in at the bottom and leave at the top. Now, there are clear indications that the peak may already have arrived, as memory industry participants are busy building more capacity. However, a slowdown in chip sales has started creating oversupply conditions, as evident from the rise in Micron's inventory levels of late. Of course, Micron bulls might argue that the company is worth taking the risk thanks to a rock-bottom price-to-earnings (P/E) ratio of less than 4. But the company's inconsistent earnings power means that investors shouldn't be taking this dirt cheap multiple at face value. In all, Micron seems to be at the end of the memory price boom, raising a big red flag for investors. While Micron plies its trade in a cyclical industry, Skyworks Solutions is sitting on multiple catalysts that should ensure secular long-term growth. The Internet of Things (IoT) market, for instance, is a big opportunity that Skyworks can tap, as its radio frequency chips are essential for enabling connectivity between different devices. That's because the number of connected IoT devices is estimated to jump from 20 billion last year to more than 75 billion by 2025. Skyworks is going after this massive opportunity by targeting fast-growing IoT niches such as connected cars, connected homes, and industrial applications, among others. The good part is that the company is tagging along with well-known players to take advantage of the IoT opportunity. Lighting major Philips, for example, has opted to use Skyworks' connectivity chips for powering connected street lights in smart cities. Additionally, machine-to-machine connectivity market leader Sierra Wireless is manufacturing data cards using Skyworks' chips. The chipmaker is also making progress in the connected car space, as it is now enabling telematics solutions at BMW and General Motors. Apart from these, Skyworks is also primed to benefit from the advent of fifth-generation (5G) mobile networks. It has already launched chip platforms to attack the 5G opportunity in the hopes of getting a head-start in this space. This is a smart strategy, as 5G adoption is going to shoot through the roof in the coming years, with CCS Insights estimating that there will be 2.6 billion 5G connections by 2025. Skyworks Solutions stock looks like a bargain at just 11 times next year's earnings, which is half the industry average. Micron Technology, on the other hand, has a much higher average P/E multiple that ranges between 14x and 31x, which is way higher than the 4x industry P/E. Demand for Skyworks' connectivity chips will remain strong in the long run given the catalysts pointed out above, ensuring that it doesn't run into a cyclical roadblock like Micron Technology. 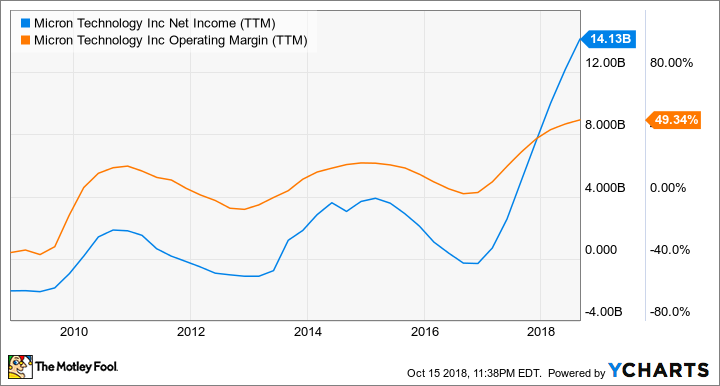 So while there's a chance that Micron's earnings power could wane significantly as memory prices decline, Skyworks should enjoy consistent bottom-line growth thanks to the fast-growing opportunities it is tapping into.